Yellow-Letter marketing has been proven over the years as one of the most effective marketing methods available. When sending a personalized, handwritten, hand-addressed yellow letter; it is not uncommon for marketers to experience response rates as high as 15%. As a Real Estate Investor, marketing is what drives your business. A 15% response rate can inundate you with calls so be sure to be prepared. Read on, and I will give you the complete Do-It-Yourself instructions for creating a Real Estate Investor Yellow-Letter Direct-Mail campaign. You may of course, use any copy you wish. This is just an example of my letter that was used to target homeowners in my farm area. Where you see circles, is where my Mail-Merge fields were to be placed. Place the white paper with the handwritten marketing copy on a scanner and scan the image into an Image Editing Software. I personally use Adobe Fireworks, but any basic Graphics application will work for this project. You want to use the software to clean-up any smudges or inconsistencies that were scanned in (if necessary). Then save the image as a JPEG file. Open a word-processing application. I personally use Microsoft Word 2003; however any word-processing software with the Mail-Merge feature will suffice. If you’re strapped for cash, you may obtain OpenOffice which contains a free word-processing application that has the Mail-Merge feature. OpenOffice is fairly similar to Microsoft Word. Open a new document and import the handwritten JPEG into the document. You will do this twice as you need to crop the main JPEG twice to divide the image, so to make room for the mail-merge text fields. Create a font using your own handwriting. I used the website www.yourfonts.com to create mine. It is very easy to create a font with your own handwriting using their service. I won’t detail the instructions for their service here, but after following their simple directions you’ll have your handwriting font as an option available in your word-processing application. This takes 20 minutes or less. For any of you that use a different application and want to know how to use Mail-Merge for it, Google it. Once you have your Mail-Merge setup, you will have place-holders that show where the Mail-Merge fields are. If you’re using MS-Word, those fields will have containers of “<<” and “>>”. So for instance, your first field may be “<<Greeting>>”. You will need apply your handwriting font to the fields and adjust the font-size to match the size of your actual handwriting which was scanned in. After scanning in the static handwritten text of your marketing letter and applying your handwritten font to the dynamic Mail-Merge fields, you’re ready to go. Load your printer with your loose-leaf, yellow ruled paper and print your campaign. Looks pretty good right? If, I didn’t tell you I doubt you’d be able to identify the mail-merged fields. Try to keep the envelopes as simple as possible. Only write the destination address on the front and place the return address on the back. Do not include your company name in the return address. Go with actual adhesive stamps and not any printed-type, the common theme here is personalization. You may have your assistant affix the stamps or you can do that yourself. Then take the envelopes to your nearest mailbox or Post Office and send them out, wait a couple of days for the flood of calls! I’m a rookie wholesaler that is working exceptionally hard to make it in Real Estate Investing. Through my preparation and hardwork, I plan to accumulate a networth of 7 figures before the age of 30, and I turn 29 in November 2009. 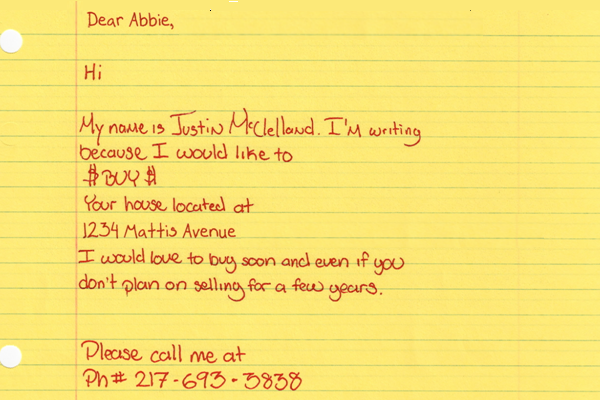 Thanks Justin/Scott for this step by step tutorial on how to do the yellow letter campaign. We are currently in the process of doing the campaign and DIO (did it ourselves). We are saving a considerable amount of money as well. We too hired local assistants to not only write the address on the letter but also on the envelope (and stuff it too). We are finding it is costing us a little under $1.00 per name (but our postage is more in Canada and we aren't using Word mail merge like you are). Our response rates are hitting 20%++ thus far, but to date, we aren't finding many motivated sellers. How are your's looking? Always look forward to your comments Dave! I'm not sure if Justin is still checking for comments on this article, but I will forward your comment to him. Hey Dave, I'm two months late…but better that than never right? As far as response rate, I experienced about 14%. If you're getting over 20%, maybe you need to be posting an article and not me! But even with my 14%, I didn't reach many motivated sellers (unfortunately we have that in common). Out of about 700 letters, I had 5 solid leads and all fell through. Oh well, I learned alot. And my Realtor got some good listing-leads out of the deal. Oh I just ran into your blog and this is great that I'm not the only struggling investor! By the way I use a yellow letter company that charges a little less than $.80 per mail (yellow letter, handwritten letter, live stamp): http://www.gofastink.com and they mail out your pieces in 2 days or so. Thanks for the helpful tip about gofastink.com. I will check it out and compare costs with what I'm doing now. I mail to my probate leads twice, 1 letter and a follow up postcard. In the future I may start mailing more, but I'm following Ron Meads advice and sticking with the above. For many it's a pain to get the probate leads, I was lucky enough to stumble onto someone who sells them to me. Costly at $100 a month, but I can't make it to the the courthouse during the week so it's my only option. Do you still have that plug for the guy who sells you the probate leads? can anyone share the content of your yellow letters? justin. i saw your youtube video on getting your content to “lined up” correctly on your yellow paper. Can you share how exactly you did this? I haven't perfected this, however you will need to do alot of adjusting to the image-size and page margins before you can have your letter semi-lined up. You will most likely run through about 20+ test sheets before you get it right. Where can I find the yellow paper? Thanks for this info on yellow marketing, Makes perfect sense. I needed a bit more info on the subject, I believe I’m all caught up now. I’ll start writing my letters. Love the info! I’m a newbie as well. Got you site lock in as a favorite. Keep up the good work! Thanks for coming by and reading my blog. Let me know if you ever have any questions. Thanks for sharing this – really helpful for newbies with not much money to spend. This recipe sounds simple enough. Unfortunately, we were using the yellow ruled paper and it jammed our printer! Actually it broke our printer. Plus, if you use the #10 envelopes you can see the paper thru the envelope and it really gets people to open it up. Here is a solution that will NOT break your printer and a VERY limited offer to have it done in a handwriting font for Free! Sorry to hear about your printer actually breaking because you used yellow lines paper. Each printer can only support a specific minimum paper weight. If you go to thin then your printer will crumple, cram and jam frequently. Take a look at your printer manual and try and match the paper weight to what it says it can handle. Some very cheap paper doesn’t list the weight on the packaging, that usually means it’s too thin to use. Thanks for posting your comments! So I’ve been following this step-by-step in setting up my own YL direct mail campaign. I’m having trouble getting the color of my handwriting font in MS Word that I’m using in the Mail Merge fields to match exactly with the color of the JPEG image handwritten letter I imported into MS Word. Any suggestions? That is a tough one, I’ve been using Black for my font so it’s a bit easier to match. I will say if you use an Ink jet printer instead of a laser printer you will get a truer match. Laser printers print flat. The only think I can say is keep adjusting the color of the font in the letter, although you may be limited by the colors your printer can actually print. You may have to put your signature picture into a program like “paint.net” and adjust the coloring of it to match the printer. This comes down to Trial and Error, I’m sorry I don’t have a quick fix for you Zac. Thanks for your reply Scott! I’m going to try re-writing the letter in black ink instead of blue for color-matching. I had used a bold blue ink gel pen prior … I may try using a fine black ink gel pen this time around … I think it will match-up better with handwritten font from yourfonts.com a little better. I have to use 20 lb. paper for my laser printer also … do you have any suggestions for a specific 8.5×11 yellow lined paper that works best? I actually haven’t found any actual yellow lined paper that comes in refill type or reams, so I’ve been using white lined paper refiles that I buy in Stop & Shop. I usually get 150 pages for $1.50 which is the best I’ve found so far. This will increase responses, use three or four stamps that add up to the 45 cents postage and then take to the post office take to windo and ask that they use an official round date stamp when they accept the letters. Here is the great source for the yellow paper !!!!!!!!!!!!!!!! where do you buy your paper? Great tutorial, I really like the creativity, but I don’t know if this really works with every printer and every scanner. I have been working with few different scanners and the results were not as perfect as in your example. However something interesting that you can check is: http://handwrittensolutions.net/. They are providing very interesting services when it comes to handwriting. No fonts are used and the result doesn’t look like computer generated at all. We have used their services few times and they are awesome. Such amazing service for such low prices, that is basically for free. I’m not sure what you are asking? Everyone I’ve spoken with in the Houston area has told me that postcards get a much better response rate than letters. What’s your experience been in that regard? The opposite here in NJ. Postcards just don’t seem to work. I did a test on a small group of Absentee owners of about 300 people. Sent them 3 Postcards over a 3 month period and my response rate was less then 1%…MUCH LESS. My response rate with yellow letters was about 6%. So I stopped using postcards. Every region/market is different so you have to test.